Volkswagen Vento Sedan Car Refresh primed for September 2014 launch? Volkswagen Vento Sedan Refresh primed for September 2014 launch? Volkswagen India will endow the Vento sedan with a new 1.5 liter-4 cylinder TDI turbo diesel engine that made its global debut last week, in the facelifted Polo TDI’s engine bay. While the regular Polo TDI uses the engine in a 89 Bhp-230 Nm state of tune, Volkswagen will also launch a higher powered version (103 Bhp-250 Nm) of this engine in the Polo GT TDI mode, due for a launch next month. The higher state of tune is what will make it to the refreshed Vento sedan, whose 1.6 liter-4 cylinder TDI engine will make way for the new motor. A 5 speed manual gearbox will be retained on the manual variants. Rumours suggest that the refreshed Vento Diesel will use a dual clutch automatic gearbox, giving the car a lead over the only other diesel automatic car in its segment, the Hyundai Verna. Faster shifts and better fuel efficiency are two important features of the 6 speed dual clutch automatic gearbox and the Vento Diesel equipped thus is expected to be top performer in the diesel automatic class. The Vento DSG will be aimed at driving enthusiasts who want a quick diesel car with the added comfort of an automatic gearbox. Volkswagen India’s Future Roadmap Detailed. The petrol variants of the Vento will come with a choice of two engines, a 1.6 liter-4 cylinder naturally aspirated motor (103 Bhp-153 Nm) and a 1.2 liter-4 cylinder TSI turbocharged unit (103 Bhp-175 Nm). The 1.6 liter MPI petrol engine will continue using a 5 speed manual gearbox whereas the 1.2 liter TSI turbo petrol motor will feature the 7 speed dual clutch DSG automatic gearbox. 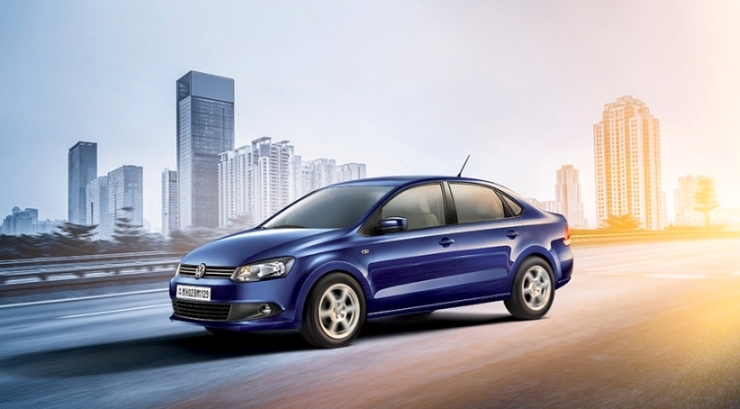 The Vento Diesel DSG is likely to be the most expensive variant of the car, sitting above the Vento TSI model. Visual changes on the refreshed Vento could include the new front fascia treatment first seen on the Polo Facelift, and minor changes on the interiors that include a new steering wheel and a revised center console housing. However, a more comprehensive facelift for the Venro sedan will arrive only next year. Through the major facelift, Volkswagen India is expected to style the Vento with features that make it look different from the Polo hatchback, in order to increase the differentiation between both cars, which currently look similar.